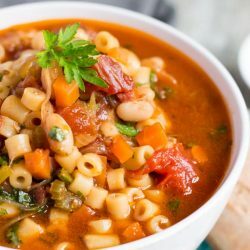 Make this super easy Minestrone Soup in just 30 minutes. The soup reheats well, so is a quick meal to make in advance, and as an added bonus it can also be frozen. In a large pot, gently fry the bacon until the fat starts to render. Add the olive oil and onion. Fry the onion until it starts to soften. Add the garlic, carrot and celery. Continue to fry until the vegetables start to soften. Add the chicken stock and bay leaf. Bring the stock to the boil, then reduce to a simmer. Add the beans, tomatoes and pasta. Crush the tomatoes into the soup with the back of a spoon. Continue to simmer until the pasta is cooked. Serve in warm bowls with grated Parmesan. If your bacon rashers are large then use three instead of the six specified above. Use a small pasta shape. They swell to the same size as the cut vegetables, and are easy to pick up with a soup spoon. Use the pasta quantity as a guide. Just consider that the more pasta you add, the less liquid there will be in the final dish. The soup will thicken on standing. Leftovers will last in the fridge for up to three days. Serve the soup in warm bowls with grated Parmesan to sprinkle over.